The crane lowered the little orange submarine until it finally touched down snuggly onto its ramp on the back deck of the Palmer. Behind it, the overcast, foggy skies blended into the glacier front a few kilometers away and down to the rest of the ocean surrounding us. As soon as the Hugin rested in its aluminum cradle, Anna Wåhlin, eyes bright and a devious smile beaming across her face, gave a giant high five to Aleksandra Mazur. The Hugin Autonomous Underwater Vehicle (AUV) had just returned from its ninth deployment that, on the surface, appeared to be an uneventful one with calm waters and a simple recovery. Knowing Anna, though, that smile and high five meant something more than your average Hugin homecoming. Up until this point, the TARSAN research team had collected a variety of water measurements using the Hugin AUV, as well as by our newly tagged seals, ocean gliders, and shipboard conductivity, temperature and depth (CTD) instruments. Marine sediment coring and ocean bottom mapping were produced by THOR to understand past and present geological changes around Thwaites. GHC collected rock and biological matter to help understand the recent ice sheet changes in the area. Often when research groups work separately, they look at one, or maybe two, parts of the ecosystem. For instance, on an oceanography cruise, they might take a mind-numbing several hundred CTD casts to look primarily at water properties and not much other data. While the other parts of the environmental system don’t get entirely ignored in these projects, they often take a back seat to the primary objective. Peripheral data might not get captured to its full extent, or at all. With everyone onboard having similar focus, sometimes ideas can get tunnel vision or miss the important related components that fall under other fields of expertise. As any physicist would know, the most efficient way to make progress isn’t through a linear progression: it is to create a chain reaction. When one of the most important climate change unknowns of our time, the future of Thwaites Glacier, came across their plate, the US and UK polar and environmental scientific programs decided to facilitate by turning on all of the light bulbs at once. The International Thwaites Glacier Collaboration (ITGC) synergy was born and, within it, collaborative projects like this research cruise. The instruments onboard the Palmer get wielded by experts in multiple fields and every bit of information gets squeezed out of the ship’s capabilities. As we say in science, one person’s noise is another person’s signal; killing two birds with one stone is exactly what our funding agencies and the public loves in the science they fund. Groups working together means that all the signal is used, and cross-over and seeding into new kinds of projects and ideas becomes rampant. When you put 27 learning-driven individuals together on a boat for nine weeks, each with unique expertise, the result is a firestorm of ideas and productivity. You can idly turn in your desk chair, see a cool plot of data on someone’s computer screen, and all you want to do is ask what it is and what it means. New instruments you’ve never seen, everyone gathered around a table looking over something, complaining about an unsolvable problem at dinner or sketches on a white board, all of us hopelessly become like moths to a flame. This embodies the core vision of ITGC: bring eight different research projects with many different kinds of expertise together to solve one of the most important questions of our time -- what can we expect from the sea level wildcard, Thwaites Glacier? The Hugin mission on that fateful day took place within 48 hours of our first sighting of Thwaites Glacier. During that time, we not only became the first cruise to ever access the western side of the ice shelf, but also to map the sea floor in areas never explored before in history. Leading up to that day, the researchers had expected to test the Hugin in various scenarios that would prepare it for going under Thwaites Glacier during its next field season in 2020. This season, we would test the Hugin in shallow open water where it easily navigates, under sea ice with the ship standing by, and finally on a longer mission underneath Pine Island Glacier where a different submersible had already taken some measurements to pave the way for the Hugin. Then it would be ready next time for the crème de la crème of all missions, under the uncharted Thwaites. The first step leading up to Anna’s Saturday morning Hugin smile came with those first few hours at Thwaites where THOR scientists mapped along the entire front of the ice shelf with the ship’s multibeam system. The Kongsberg multibeam system is a pretty high-tech piece of equipment. It sends 432 beams of sound down from a transducer on the bottom of the ship in a fan toward the sea floor. Some of the sound bounces off of the seafloor and back to the ship to a receiver. Some also bounces off of other objects or even density changes from within the water column, which for our THOR geologists is usually considered erroneous “noise.” A receiver on the ship records the properties of the sound that make it back, its strength, and the travel time and sends the data to a computer in the belly of the ship. Simply, one could know the sound velocity of the water below the ship and the time it takes any ping to come back to calculate how deep the bounce occurred. To make a best estimate of the seafloor depth, a series of complex algorithms ingest the multibeam measurements, information about the ship’s movements, and water properties acquired by the CTD that tell us the sound velocity. Within the “noise” of the data that isn’t deemed to be seafloor can be found vital nuggets of information that, if looked for and not discarded, add that little boost that means the difference between a longshot sketchy idea and a brilliant one. In this case, pings in the water column considered “noise” for a geologist looking at bathymetry became the glaciologist’s signal of approximate ice shelf depth. With the multibeam, we mapped the entire 57 kilometers (31 miles) of Thwaites northern and western ice front, which had stepped back and cleared of sea ice by more than 18 kilometers (10 miles) in the last couple years. It was completely inaccessible before this anomalously ice-free year. THOR had Drs. Alistair Graham and Kelly Hogan on the task who specialize in producing bathymetry maps and have the insight on how to maneuver the ship to get the measurements we need to, for example, see as far under the ice shelf as possible. Getting a one kilometer look at the sea floor depth under the ice shelf and some background noise from the water column to get an approximation of the depth of the ice shelf suddenly gave the other scientists on the ship a lot of knowledge about what to expect under the Thwaites ice shelf. As you might have already guessed, Anna’s devious smile after the return of the Hugin meant she had just sent the submersible underneath the Thwaites ice shelf. Interestingly, since the Hugin is also a Kongsberg instrument, it carried a miniature and higher frequency version of its big brother’s multibeam to map the sea floor in much finer detail than the ship’s sensor. The Hugin measured water properties, brought back samples of water from underneath the ice shelf, and may even have measured the shape of the cavity beneath the ice shelf. 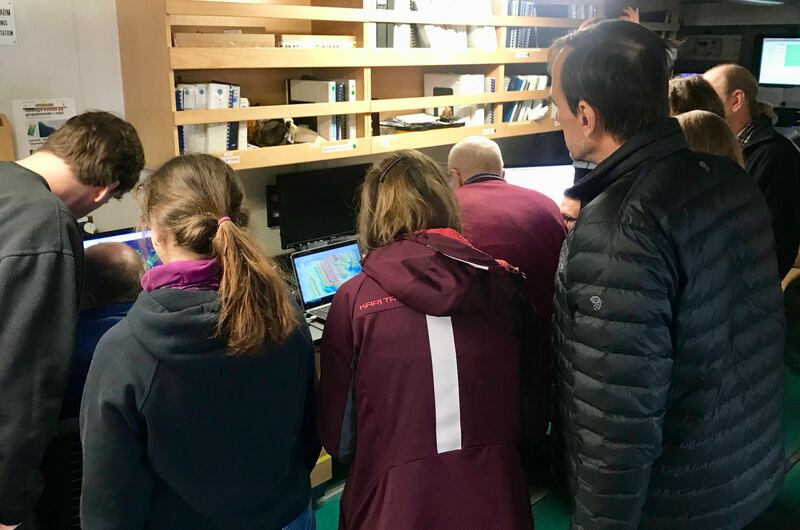 No instrument has ever been under Thwaites before, and the information from the brave little submersible will be crucial for understanding how much heat reaches the glacier’s underbelly and whether the glacier may already be unstable.